Leslie has always loved and lived peacefully with multiple cats. When the staff at Berkley Animal Care Services warned her that Destiny didn’t like other cats and was often aggressive, Leslie brushed it off and assumed she would be fine once home. 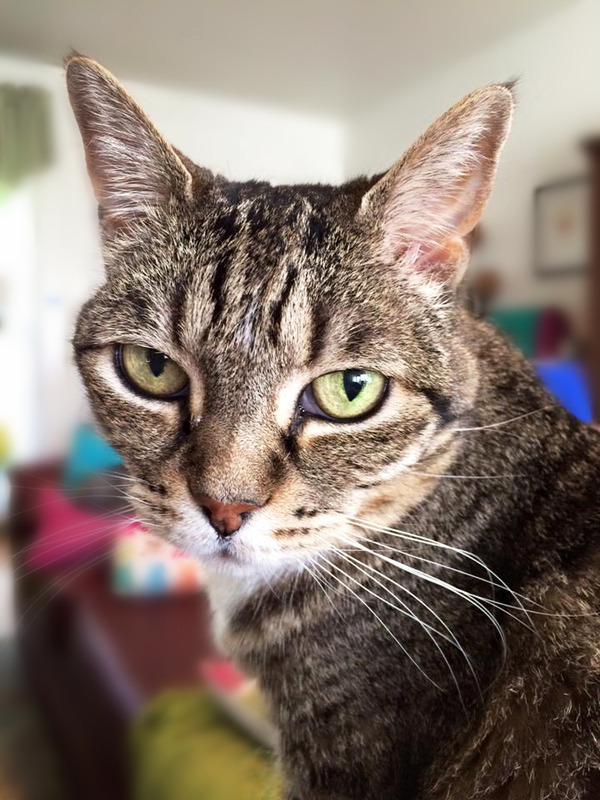 Destiny, a 12-year-old brown tabby, the oldest cat at the municipal shelter, was clearly living on borrowed time. Leslie adopted her on the spot, renaming her Vivian, which means alive, to celebrate her survival. She followed her usual cat introduction routine and kept Vivian secluded in the bathroom for the first few weeks. As she had done with other newcomers, she brought Vivian beds, blankets and toys to smell and help her adjust to life with other cats. But things didn’t go as smoothly as they had in the past, Vivian growled, swatting aggressively, and then backed up and hid behind the toilet. Treats and food did not help ease her fear aggression and she grew more anxious by the day. Leslie knew returning Vivian to the shelter was not an option as she would be euthanized. And so she made an appointment with a veterinary behaviorist at UC Davis Veterinary Medical Teaching Hospital. Vivian was diagnosed with severe fear-aggression and was prescribed Prozac and put on a desensitization and counter-conditioning program, designed to gradually introduce scent, sound, and sight of other cats in a non-threatening, positive way. There were no guarantees it would work so as a back up, Leslie tried to find a home without other cats, even offering to pay Vivian’s vet bills for life, but no one was interested. Leslie moved Vivian out of the bathroom and into her office for more space. Gradually, she started introducing her cats’ blankets and toys with a trail of treats to encourage Vivian to explore and interact with them. Any time Vivian reacted aggressively with hissing, swatting, or hiding, Leslie removed the object and the treats and left the room quietly. Vivian eventually started approaching the object and eating the treats. Once they conquered this first hurtle, Leslie then installed a screen door (with a curtain to start) and each day moved the treats closer to the door. Many months later, Vivian eventually reached the point where she would eat treats near the door with the curtain open. Leslie also started feeding her other cats directly outside the door so they were only a few inches apart with only the screen door separating them. After 10 months, Vivian surprised everyone and ventured into the living room, quickly claiming a cat bed as her own. Over time, she has adjusted to the point where she is fine with other cats being nearby as long as they do not get in her space. Getting too close still sometimes results in a stern hiss and swat. Vivian is now 18-years old and has been with Leslie for six years. She continues to make remarkable progress and has even befriended Riley, a cuddly boy who spent years trying to win her over. She tolerates him as long as he plays by her rules. Most recently, Vivian even joined Leslie and the other cats on the bed . Pets, like children, are for life. With love and patience, most cats and dogs can find their way back no matter what they have experienced – though sometimes this means adjusting our own expectations and letting the animal take the lead. Leslie is a shining example of compassion in life choices and all that is possible through hope and commitment. You can find more information on fear aggression in cats and introducing new cats here. In addition to being an amazing adopter and feline advocate for cats with fear aggression, Leslie is also a talented artist and children’s book illustrator. She donates a portion of her sales to cat rescues and shelters. She even has a sanctuary series inspired by her visits to Best Friends. 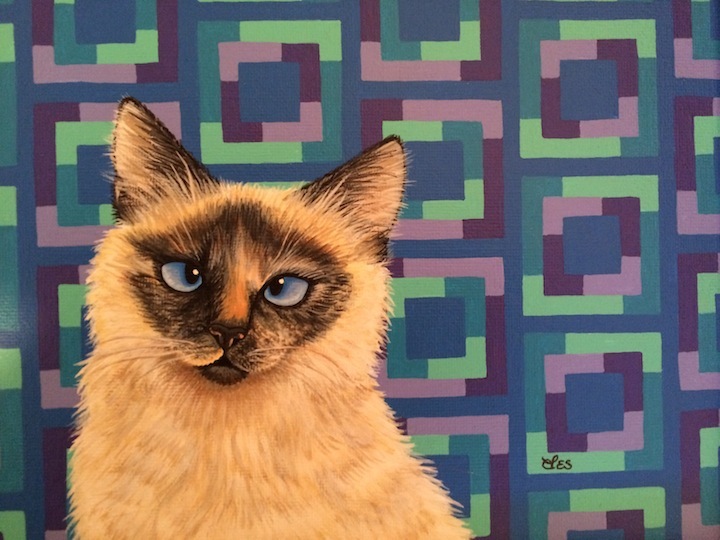 You can see more of her feline fabulous paintings on her website and Facebook page. Vivian is part of The Specials, an award-winning blog series focusing on special needs pet adoption. Senior pets, those with chronic medical issues, behavioral or temperament concerns as well as overlooked or misunderstood breeds like Pit Bulls and black cats. If not, for the courage and compassion of their adopters, many of these animals might have been euthanized in shelters or died alone and hungry on the streets. You can read more special needs adoption posts here. Great story! I love older, special needs cats and had good results with a mix of flower essences. That is such a wonderful story. My mom never gives up either, but sometimes kitties just can't be helped. We lived with our fearful adopted kitty Biene for many years. She befriended our kitty Boo at the time who was her "therapist", but after Boo suddenly passed away, Biene never recovered was always fearful and aggressive. It was so very sad. That is such a good story. What a great person to have the patience to let Vivian gain some confidence and get used to other cats, etc. It just takes lots of patience. Good job Miss Leslie. What a truly beautiful story. Vivian is so lucky that Leslie found her. 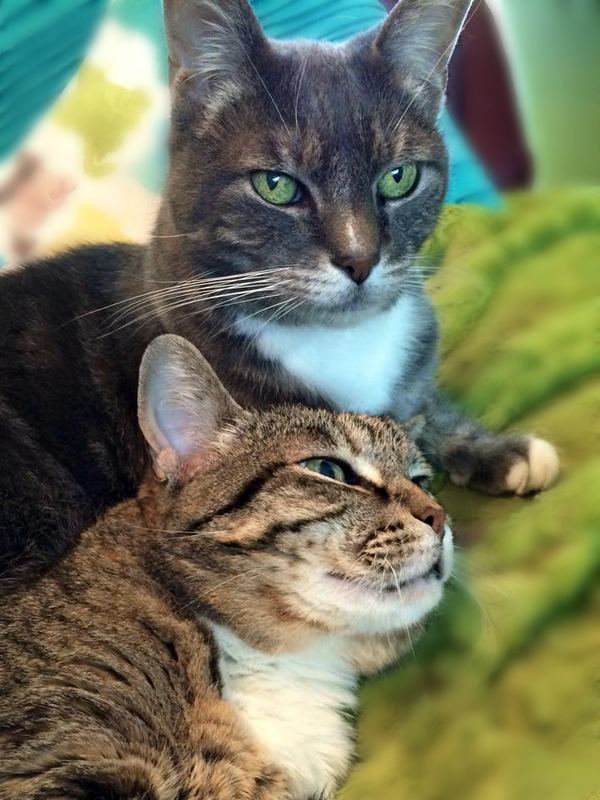 Leslie has the very patience and compassion that Vivian needed, and now the lucky ladycat is thriving because of it. Beautiful. (And such beautiful artwork Leslie creates, too! ).Thank you for sharing this with us! What a perfect way to start the week. Love it! I never thought of cats with fear and aggression but it makes sense and I'm so glad she found a good home! That was totally terrific? We have Sister Precious who has her own suite upstairs due to fear aggression, but she is safe and totally happy. There are so many wonderful people who work hard to help animals, instead of taking an easy option. Oh my stars! We know Leslie! 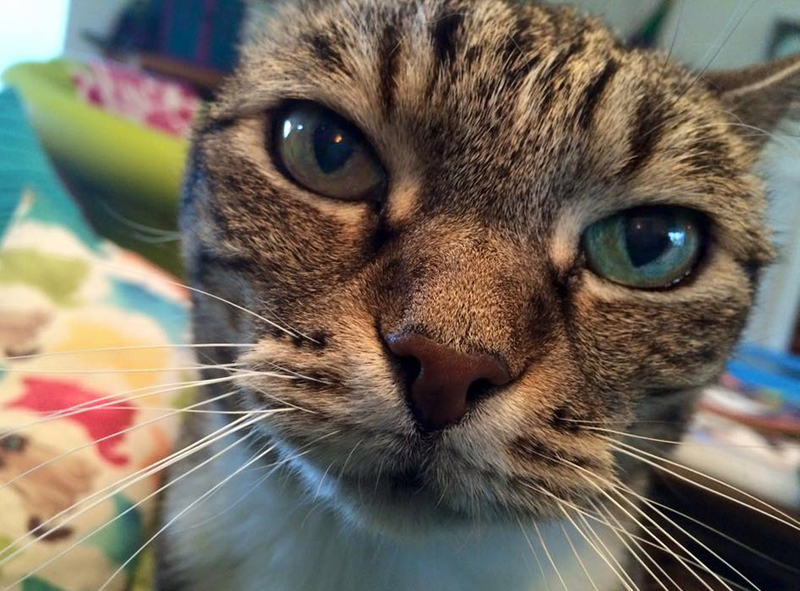 Her cat, Tallulah Jane, is in our book! Mommy has a few of her prints, too. We just love her art. Thank you, Leslie, for loving Vivian so much. She was certainly worth the extra effort! Glad she adapted and became comfortable in the home. Vivian sounds so much like our Zoey. She too suffers from fear aggression. The mom has tried everything to integrate Zoey into our home, but it hasn't been totally successful. We're happy that Leslie took a chance with Vivian. So many others would have returned her when things became difficult. Bless her for loving Vivian. Wow, what a powerful story of patience and love. Kudos to Leslie for taking the time to work with Vivian! And what good fortune that Vivian ended up with Leslie. What an amazing story of someone "standing by their cat" when so many others wouldn't have understood the cat's special needs. Paws way, way up! What a wonderful story of patience, persistence and love. Wonderful story, and I love your message about pets are family and for life. Leslie is an amazing artist…beautiful cats. Bloody Brilliant. It can take so much time, and SO MUCH LOVE and care but it CAN. BE. DONE.What a fabulous cat tale and one to give courage to those struggling now.